Ariel Carmeli started repairing and building cues while employed at the now legendary Best Billiards in Santa Ana, CA in 1991. 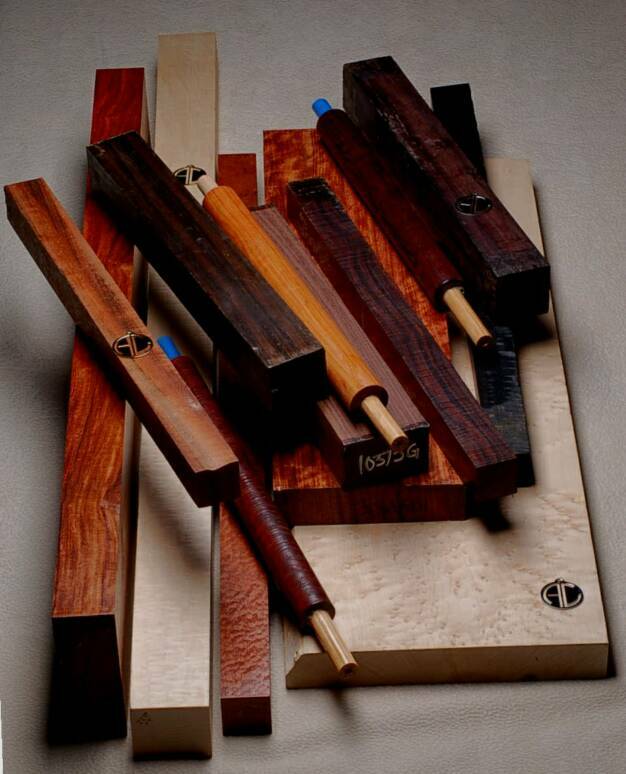 Some of the best cuemakers in America, who frequented the store, instructed Ariel on various aspects of cuemaking. After having spent many years at the craft on a full time basis, Ariel is widely recognized as a highly skilled master cuemaker. With addtional labor and expense Ariel cores almost all of his custom cue forearms for strength and stability. Whether entry level or high-end, Ariel Carmeli cues are known for their solid, clean construction and playability. More cues are always on order with Ariel--and we'll gladly discuss a custom order with you. 61. 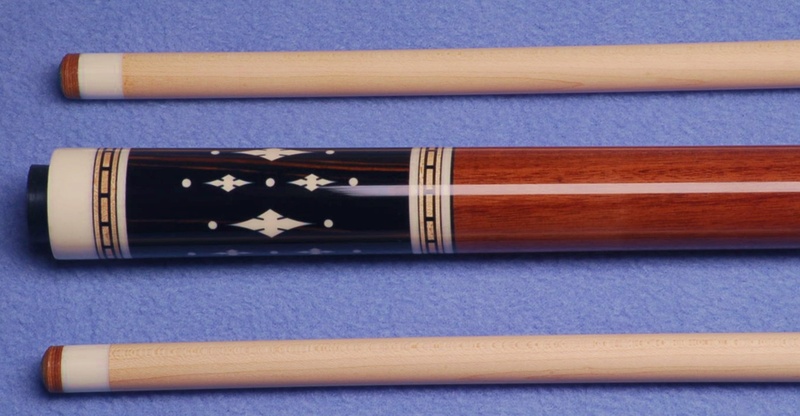 Beautiful wrapless Ariel Carmeli cue made from one-off John Davis fullsplice blank. Mexican grenadillo into Gaboon ebony with white, double light blue and black veneers. Slotted radial diamond inlays with ebony outline in each point and same motif with dots in the buttsleeve. Compound veneer dash deco ringsets at joint and also above and below buttsleeve. 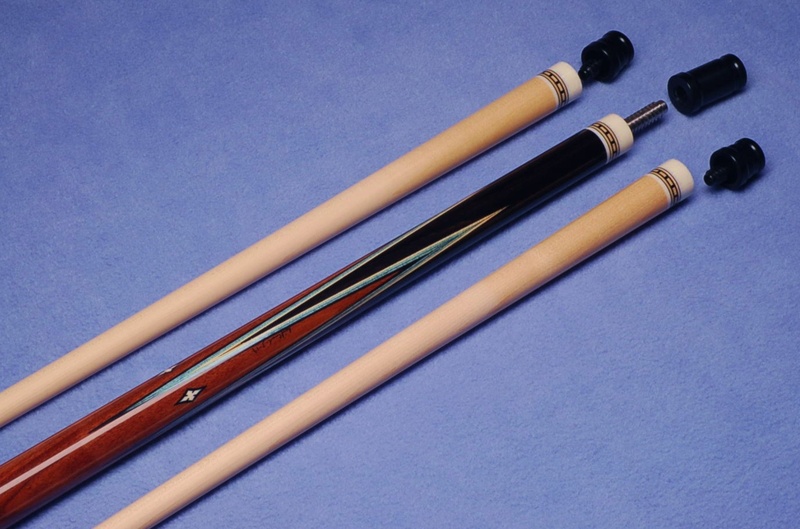 Two shafts with 5/8" linen melamine ferrules and Moori tips (3.87/ 3.91 oz.). Weighs 19.21/ 19.25 oz. with 19-1/2" balance. Black Delrin joint protector set as shown. Value price: $1,850.00.